280 pages | 3 B/W Illus. This is a major contribution to our understanding of European integration. It analyzes for the first time, in a highly systematic fashion, European integration as transnational political society formation in a common political space. Four conceptual chapters discuss different approaches to studying European ‘transnationalization’ including networks and socialization. Six empirical chapters provide in-depth studies of different aspects of this process and policy fields ranging from European party networks and university collaboration to informal economic governance in the Eurozone and police collaboration across borders. This book redresses the excessive concentration in EU research on supranational policy-making and inter-state bargaining. It will be of great interest to political scientists as well as contemporary historians, sociologists and lawyers. Chapter 1 Exploring the Territorial Politics of WelfareChapter 2. Devolution and the Preservation of the British Welfare State Chapter 3. Welfare Management in the German Federal System: the Emergence of Welfare Regions? Chapter 4. Territorial Politics and Welfare Development in France Chapter 5. 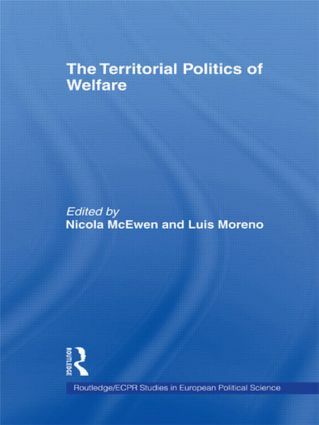 Spain, From State Welfare to Regional Welfare?Chapter 6. From the Southern to the Northern Question. Territorial and Social Politics in Italy Chapter 7. The Preservation of Social Security as a National Function in the Belgian Federal State Chapter 8. Changing Political Contexts in the Nordic Welfare States. The central-local relationship in the 1990s and beyond Chapter 9. Nationalism and Social Policy in Canada and Quebec Chapter 10. European Social Policies and National Welfare Constituencies: Issues of Legitimacy and Public Support Chapter 11. European Integration and Social Citizenship. Changing Boundaries, New Structuring? Nicola McEwen is Lecturer in Politics at the University of Edinburgh. Luis Moreno is Senior Research Fellow with the Spanish National Research Council (CSIC) in Madrid.